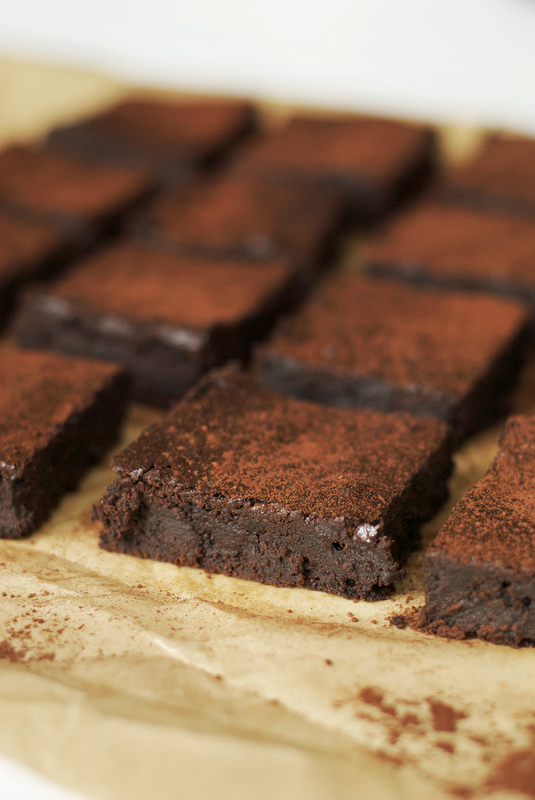 Today’s recipe is slightly adapted from Flourless: Recipes for Naturally Gluten-Free Desserts. I stumbled upon this book while shopping at Anthropologie and I completely loved the idea of baking desserts that rely on simple ingredients, natural sweeteners, and bold flavors – minus the flour. Oh, and the food photography is absolutely gorgeous. 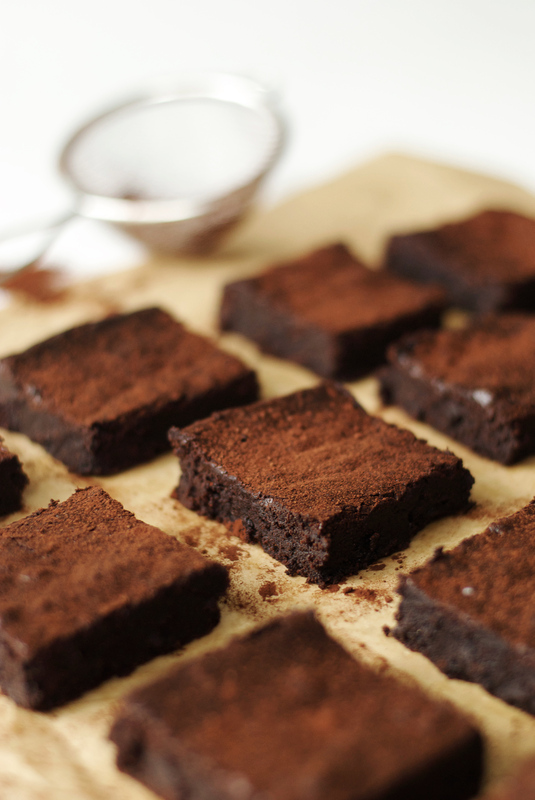 Slightly underbaked, these chocolate brownies really melt in your mouth as soon as you take a bite. I threw in a teaspoon of orange zest to the batter, because who doesn’t love that flavor combination? It’s my absolute favorite. It’s too tempting to have them around the house, so I whipped up a few batches for two dinner parties last week to avoid eating the whole thing by myself. I also look for any excuse to bake. 1. Heat the oven to 350°F (180°C) and line an 8″ x 8″ (20 cm x 20 cm) square pan with parchment paper. 2. In a heatproof bowl set over simmering water, melt the dark chocolate and butter, stirring until smooth and shiny. 3. Remove from the heat and transfer to a large bowl. 4. Add the brown sugar, eggs, cocoa powder, salt, vanilla, and orange zest. Stir well to combine. 5. Spread the batter in the pan, smoothing the top with a spatula. 6. Bake for 30 minutes, until the brownies are dry on top. Remove from the oven and cool in the pan for 1 hour. 7. 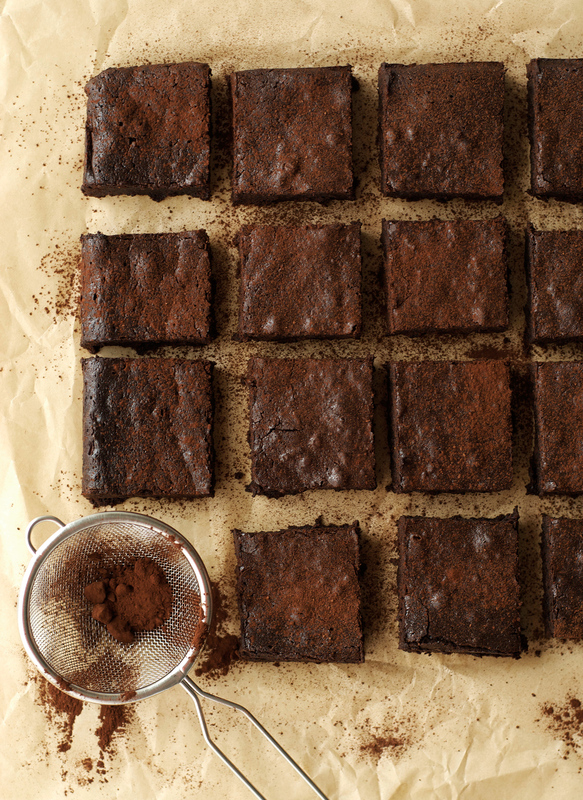 Gently lift the parchment paper out of the pan after cooling to remove the brownies then refrigerate for another hour. 8. Remove from the fridge and cut into 16 squares using a serrated knife. 9. Dust with cocoa powder and serve at room temperature.